BANGKOK — A junta legal rep said Thursday he will file a police complaint against the Pheu Thai Party for violating the Computer Crime Act and political assembly ban. Col. Burin Thongprapai’s threat was made as the party held a news conference to highlight what it described as seven failures by the military regime four years on since the May 2014 coup d’etat. 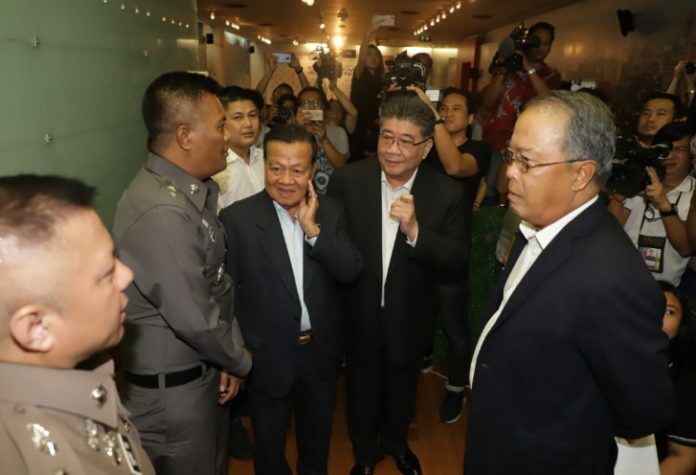 THE National Council for Peace and Order (NCPO) yesterday pursued legal cases against the Pheu Thai Party after the party read out a statement blaming the ruling junta for failing to properly govern the country in its nearly four years in power. Some military officers went to notify the police at the Crime Suppression Division. The move came as the junta government, which has come under increasing criticism for having accomplished little despite the long spell of military rule, plans to launch a “reform festival” next month as its major PR event regarding its much-hyped reform agenda. The NCPO’s legal officer, Colonel Burin Thongprapai, said that the Pheu Thai statement could have violated the junta ban on political party activities and political gatherings of five or more people. As the statement was read via Facebook Live, they could be deemed to have violated the computer crime act, Burin said. At yesterday’s press conference held under police surveillance, only three key Pheu Thai officials were on-stage to read the statement in order to avoid breaking the junta’s political ban on the gathering of five or more people. The five-page statement, issued as the NCPO is about to complete its fourth anniversary in power, accuses the junta of failing to achieve key promises, including reconciliation, dealing with corruption, protecting rights and democracy and improving the economy. It also slammed NCPO leader PM General Prayut Chan-o-cha for “failing to show leadership and delaying the election several times and aiming to stay in power for the long-term despite earlier promises”. “The past four years under the NCPO will take the country into a dark and dangerous future,” it added. The junta government is preparing to open a festival on June 6 to raise public awareness of its reform agenda through discussions on 11 aspects of reforms, to be tentatively held at CentralWorld department store. The country will never move forward if people can't take criticism and they rule with intimidation, threats and incarcerate people for nothing more than having an opinion. Good on the PT for starting to speak out; I hope that some/all of the pro-Democracy parties might speak up in support; this is a case where it is in the interest of all the Forces of Goodness to stick together, no matter if you like the PTP or not. While I could be wrong, I think it was one of the early Americans fighting the British who said "Either we hang to together or we hang separately". Should the pro-Democracy parties/groups allow themselves to picked off one-by-one, they will only have themselves to blame. While I understand that there is lingering dislike and distrust of the PTP (I can't argue with that and won't even try), I hope all will focus on the removal of the Junta as the main priority for the election; if the Thai people allow the Junta another four years to entrench themselves, it'll be almost impossible for the country to move forward and progress into modern times. The Thai people deserve the leadership of their choice. They also deserve the right to remove that leadership if they so choose. As well as you have to blame this party for many things in the past, it´s only right to say they state a very clear view about how important it is with freedom of speech and political meetings in a working democratic nation. As much as i agree with PT's stance, and as much as i despise the junta, PT basically had the best chance ever to do all the good things that Thailand needs but just couldn't help being corrupt as hell themselves. Corruption and incompetence appear to be in the DNA of any and all political heavyweights here. Nothing could be truer. Is there anyone who can point to anything the junta has achieved over the four years. The PM makes endless pledges and commitments but has nothing to show for his words. He spends his time micromanaging everything from lewd dancing to beach chairs to the lottery system. Again, anyone care to nominate a worthwhile achievement by the PM? Reducing the road toll? Improving education? Overhauling the RTP? Preventing corruption? Making a start on the HS trains? None of those! The only thing the junta is successful at is verbalising what they are gunna do. Underachievement is their greatest success. Four years of nest feathering, wasting money on weaponry, dressing up in costumes and allowing corruption to run rampant is the best they have offered. Again, anyone care to nominate a worthwhile achievement by the PM? Not restricted to political heavy weights... Basically, anyone in a position of assumed authority with any kind of access to funds !! And now Prayuth is backtracking on his previous statement that the established political parties will be able to fully function in June. It's going to be gradual apparently. As well as you are right, that ain´t Thai specific. Politicans are pressed to the limits in every country all over the world. It shows how free and fair elections will be.